Who does not love a nice compliment every now and then? We are happy when our customers are happy. Each day or so we go on to Amazon and check to see what people are saying about our Quick and Carry Bags for the Instant Pot and other electric pressure cookers. We are always gratified by the nice things our customers have to say about our bags! Not every comment is a glowing one – some people don’t like that the bag does not collapse all the way down, and one person did not think the padding was thick enough. We take that constructive criticism very seriously and make changes to our designs when we can. The next iteration of the bag had stronger padding on the sides, which just made our bags even better! So, please know that if you leave a comment for us on our Amazon page, we are paying attention and taking your comments to heart. We are committed to making sure that our bag is the best bag out there! “Nice quality bag to store and carry my 6 quart Instant Pot rather than keep putting it back in the box for safe keeping. My only complaint is there needs to be some type of hard siding in the lower portion of the bag to stabilize it. I say this because if you put accessories (steamer baskets, extra sealing rings, trivet, etc) in the top compartment it collapses on it and makes it hard to get the Instant Pot out without unloading the top zippered compartment. We are working with our team to address all design and manufacturing problems that we know about, and we are committed to making sure that our bag is the best bag out there! 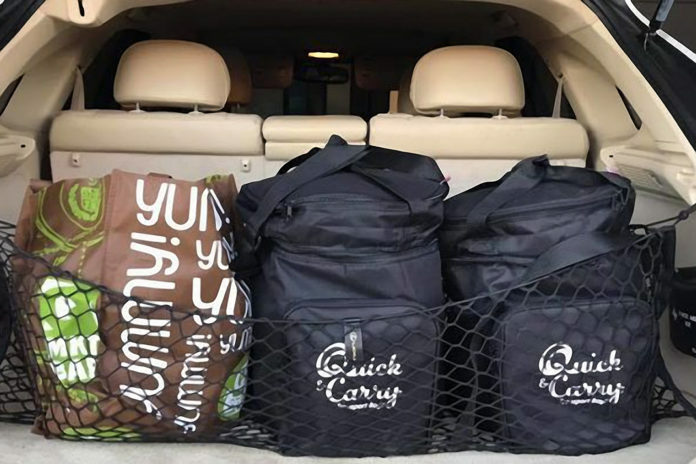 Note: Our thanks to Urvashi Pitre for sending us this photo of the back of her car as she prepared to go teach an Instant Pot cooking class based on her cookbook, Indian Instant Pot Cooking. Previous articleButter Chicken in the Instant Pot – YUM!